What is a Grommet & Why Does My Flag Need Them? Grommets are small metal rings used to reinforce holes in fabric so it does not tear when a cable or rope goes through it. Also called eyelets, you’ll often see grommets used in flags, banners, shower curtains, even in shoes for shoe laces! If you purchased a flag or banner that didn’t come with grommets already installed, you may want to add them yourself before hanging it. Luckily, you can purchase grommet kits at most hardware or craft stores and installing them is actually quite easy. The kits come with the two pieces the make up a single grommet - essentially a male and a female piece - and the tools used for installing them in your fabric - a setter and an anvil. To install the grommets in your flag, first determine how to position the grommet. Consider how far from the edge of the cloth they’ll need to be, how many you’ll need, and how far apart from each other the grommets should be placed for full support. Once positioned, you’ll want to trace the inside circle of the grommet onto the fabric using a pencil. Then, using an Xacto knife, cut an X across the center of the traced circle. 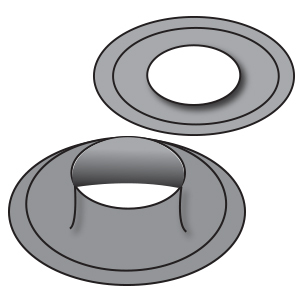 Take the male portion of the grommet and push it through the hole in your fabric made by the cut X, then place the female or washer portion of the grommet over the top. Now, using the setter and anvil that come in your grommet kit to sandwich the grommet and washer, use a hammer or mallet to hit the two hardware pieces together. How you go about hanging a flag using grommets will vary depending on what you're using to hang the flag and where you'd like it to hang. Hanging a banner on the front of a building will be very different from hanging a flag on a pole! Flagpoles themselves also vary widely by style, with smaller poles for residential uses and much larger poles for schools and other public facilties. 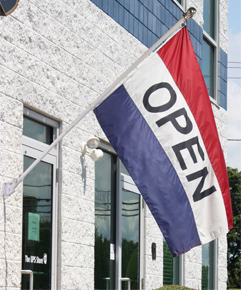 The style of flagpole may affect how you choose to hang a flag on it. For example, some flagpoles only have rope for hoisting up your flag, others come with special clips or hooks. If your flag pole doesn't come with hooks or a rope, you can always thread zip ties through your flag's grommets and around the pole to hold the flag in place. 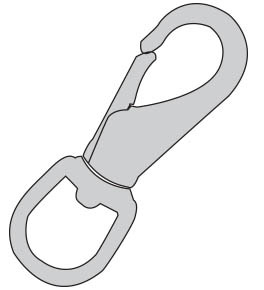 We recommend using snap hooks like the one seen to the left in most flag hanging scenarios involving grommets. This is because the hooks incredibly easy to clip right onto your grommets. 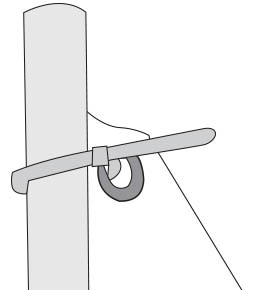 Then, all you have to do is attach the loop end of the clip to your flagpole using rope, hook & loop touch fasteners, or zip ties!